A practice-makes-perfect book and MP3 set for intermediate to advanced bassists. Becoming a great bass player doesn't happen overnight! It takes practice, discipline, and perseverance. Daily Grooves for Bass is jam-packed with a different groove for every day of the year: 366 total (just in case you start your groove journey in a leap year!). These funky, hip, and inspiring bass grooves will get you reading and playing grooves worthy of any bassist's repertoire. Establish a fun and healthy practice routine without the "chore" of trudging through a typical exercise book. 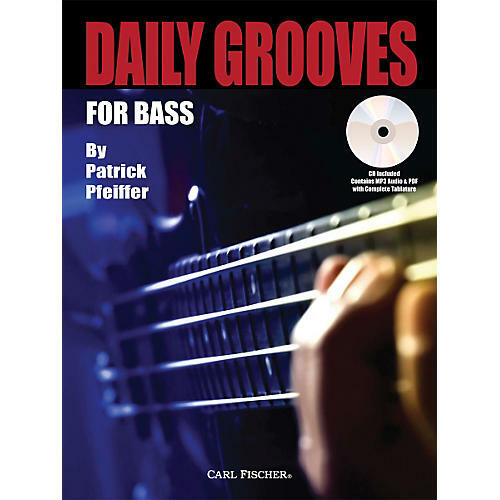 The riffs on Daily Grooves for Bass are limited to one or two measures and are then repeated, just like bass grooves in real playing situations. To capture the musical flow of each, try these bass techniques out in your own band, make them your own, and enjoy riding your "groove-wave"! The bass lessons are intended for intermediate to advanced players. The included CD contains MP3 files for each groove as well as complete, printable PDF tablature files. Learn bass grooves one day at a time throughout the year when you order today.